Penzance Hotel and Hotels in Penzance. All the Hotels in Penzance and the Hotel Penzance, Cornwall. Winner of the 'Hotel of the Year 2006' and ' Restaurant of the Year 2006 & 2007' at the Cornwall Tourism Awards. The Hotel Penzance offers quality accommodation, superb food and fantastic sea views. We provide room, bed and breakfast, as well a full restaurant and bar service. The hotel overlooks Mounts Bay and Penzance Harbour and offers a superb base for exploring and touring enigmatic West Cornwall (read more). The Old Coastguard Hotel is a delightful hotel set in sub tropical gardens leading to the sea; above the the beautiful fishing village of Mousehole. The hotel provides luxury accommodation combined with breathtaking scenery. Mousehole is a vibrant cornish village very near to the thriving market town of Penzance (read more). At the Blue Seas Hotel, you will find comfortable accommodation, friendly service and excellent food. We offer a peaceful and relaxing environment away from the stress of modern life. This charming grade II listed family-run hotel set in a south-facing Regency terrace is ideally located for visitors to West Cornwall. Our rooms are all en-suite, most of them having stunning sea views over Mount's Bay towards Newlyn. All have colour TV, central heating, tea and coffee making facilities, fresh flowers and chocolates. Breakfast is an important start to any holiday. We propose a wide range of breakfast choices; the full English, the continental buffet with fresh fruits, variety of cereals, yoghurts, croissants, and home-made brioches, bread, jams and marmalade, etc. Multiple award winning non-smoking Guest House accommodation with quality of service for visitors to Cornwall. Ideal base for both guests seeking a break and those requiring a relaxing time while on business. The Award winning Camilla House offers comfortable and relaxed accommodation in a totally non-smoking & friendly environment. Provides an ideal base for exploring West Cornwall - St Michael's Mount, Lands End, St Ives, Minnack Theatre, many Sub Tropical Gardens and convenient for travel to the Eden Project & Falmouth Maritime Museum. Guests enjoy either a Full English Breakfast or the 'Camilla Special' which includes fresh fruit of the season and local cheeses. Licensed and Broadband Internet access throughout hotel. Free parking available, 5-10 minutes walk to train/bus station & ferry for Isles of Scilly. From the moment that guests make an enquiry, right through to their departure, the Camilla House Hotel aims to provide high levels of customer care and comfort. 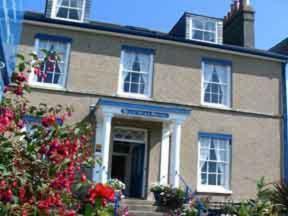 Detailed travel arrangements, car & bike hire, guided tours, personalised itineraries, picnic hamper loan, restaurant bookings and being an Agent for the Isles of Scilly Steamship Company, are just some of the many services guests can expect from the Camilla House Hotel. The Queens Hotel is an elegant Victorian hotel on the seafront promenade at Penzance with views of St. Michael's Mount and Mounts Bay. All 70 bedrooms have digital TV. The sea facing restaurant uses local Newlyn crab, fish and local produce. A hair and beauty salon, free car parking, disabled access and WiFi access are available. The hotel is walking distance to the town and galleries. Originally built as a Gentleman's residence, Boscean retains much of its inherent character and charm with open fires, oak panelling and a magnificent oak staircase. Now a family run hotel under new ownership, the hotel offers a high level of customer service in a relaxing, friendly and informal environment. All of our guest accommodation is en-suite with either superb views over the sea or the gardens and surrounding countryside. All rooms have plenty of character, and are furnished to a high standard, with modern bathrooms. Boscean has over 2 1/2 acres of private walled gardens for you to enjoy - relax in the early evening with a drink as you watch one of the wonderful sunsets we have here in West Cornwall. A Georgian mansion, set in the country. All bedrooms are en-suite and have views over the sea or the moors. The heated indoor swimming pool is open March to October. A comfortable lounge, licensed bar, open fires and full central heating continue the warmth of the welcome you will receive. One and a half acres of gardens completes the picture. Situated on the Land's End Peninsula in the Far West of Cornwall, U.K., Boswedden House provides a beautiful, tranquil and comfortable environment for workshops, seminars and retreats. This is a place where body, mind and spirit can relax and renew in a caring atmosphere yet very elemental location. "If you need to unwind, be nurtured and inspired, you are welcome to come to one of our workshops or retreats". A Golfer's Paradise on the only Cape in England, nestled away at the very tip of Cornwall 4 miles from Lands End. The course is poised on the edge of the ocean, surrounded by iron and bronze age settlements and old mine workings. The ss68, par 70 course is one of the country's more intriguing with lies on undulating land and dry stone walls. A true bolt hole away from the crowds an excellent restaurant and a fully fitted health club including sauna, solarium, gymnasium and 45 foot indoor swimming pool. Small 18th Century hotel close to town & harbour. Ideal for train /coach travellers. Super food & comfortable bedrooms. Standard rooms with optional private bathroom, en-suite rooms also available. Tours available. A former coaching inn run by the Woolcock family for over 100 years, the Commercial is well-known locally for its great food and warm Cornish welcome. It makes an ideal base for people wishing to explore the coastal paths and beaches of the Land's End area. Our accommodation has a 3-star rating with all the expected amenities as well as free Wi-Fi broadband internet access available to all guests. All of our rooms are spacious and tastefully decorated assuring a comfortable stay in pleasant surroundings. If you are dining with us you will not be disappointed. We have an extensive menu with weekly specials which take advantage of the great local produce available. Our Sunday roasts are famous. We also specialise in simple fresh local fish and shellfish dishes. You must try the crab and prawn pancakes. Our conservatory dining room leads out onto our beautifully planted patio and secluded garden where parents can enjoy a relaxing drink while the children let off steam on the lawn play area. Dunedin is a large Victorian house and was built in 1886, it has 8 tastefully furnished bedrooms, each with modern en-suite shower, wash basin and WC together with colour Freeview digital TV, radio alarm, hair dryer, cooling fan and tea/coffee making facilities. The Dunedin is situated in a wide and tree-lined avenue leading to the seafront, with its long promenade and sheltered bay and there is unrestricted parking on both sides and for most of Alexandra Road and the adjoining roads. Situated on the edge of town, but within a few short minutes walk of the centre and the seafront, Dunedin is in the ideal position to visit all the many and reasonably priced pubs, restaurants and other attractions in Penzance. Breakfast is served in our bright and airy dining room, which is situated on the lower ground floor, and there is a selection of cereals, chilled fruit juices and segments and cooked to order main courses to suit a variety of tastes and preferences. The Longboat Hotel offers 7 en -suite rooms with central heating, tea /coffee making facilities and television. We also offer 8 standard rooms with central heating, television and tea/coffee making facilities. Try our Restaurant and sample our Trencherman's Menu or have a drink in our Bar with entertainment 5 nights of the week. All rooms are non smoking. We also welcome Children of all ages. Pets are accepted, but only under total control of the owners. We have a spacious resident's lounge to relax in, which is also a smoking area, or if you wish you can relax in the bar and have a drink and enjoy the entertainment, or enjoy a meal in our restaurant or both! A hearty Full English Breakfast can be ordered upon arrival at a charge of £4.95 per person. Mount Royal Hotel is a Georgian, part Victorian house and has been a family run hotel for over 35 years. The hotel faces the sea and overlooks the entrance of Penzance harbour with panoramic view of Mount's Bay, St. Michael's Mount and the Lizard peninsula. Spacious bedrooms with en suite facilities, Premier rooms with spectacular sea view. In the elegant Victorian dining room, enjoy breakfast served to you at your own table in the traditional way. Our aim is to make your breakfast an enjoyable start to your day, choose from our comprehensive menu. Please note that our terms are bed and breakfast only, we do not offer evening meals. Close to the Scillonian ferry departure point and nearest hotel to the heliport for flights to the Isles of Scilly. Five minutes to town centre, coach and rail terminus. Free private parking in our own grounds for persons staying at the hotel. Lock-up garages available for persons visiting the Isles of Scilly at extra cost. Free transport arranged for the ferry departure point or heliport for persons leaving their car at the hotel for a week or longer. This family run guest house is a short walk from the Promenade and centre of Penzance and offers friendly atmosphere, we support "Fairtrade" and all produce is quality locally sourced. All rooms are en-suite and have Freeview digital TV, tea and coffee facilities. On Street free parking. Totally Non Smoking House. Marc and Anne would like to welcome you to our small, friendly, family run Guest House. We offer high quality bed and breakfast accommodation and are close to the bus and train stations and only a few minutes from the town centre, heliport and harbour. We are close to, but not on the main road and many guests have commented how quiet our street is. Penrose Guest House is a Grade II Listed Georgian building approximately two hundred years old, maintaining many of its original features. It is ideally situated for easy access to the town centre with its many shops and restaurants. It is in an elevated position with most rooms having views of Mount's Bay. We are open all the year round and have full central heating. We operate a non-smoking policy, for health and safety reasons, but smoking is allowed in the garden or under our covered porch. A character 18th Century Georgian Hotel situated in the heart of Penzance, ideally located for all local attractions. An ideal base for tourists and business people alike. Personal, professional service. We are non corporate and believe in attention to detail. The hotel has been totally refurbished, bringing it right up to the 21st century. Digital televisions, wireless internet, en-suite bathrooms with power showers and, of course, very comfortable beds. Whether you are touring Cornwall, visiting for business or just getting away from it all, we promise you a happy, relaxed and memorable stay. Our award winning in-house restaurant is open daily from 7pm till 10pm offering an extensive a la carte menu featuring all local produce and fresh fish from the neighbouring Newlyn fish market. Our fully stocked and licensed bar is open at your convenience. Whether you are touring Cornwall, visiting for business or just getting away from it all, we promise you a happy, relaxed and memorable stay. A warm and friendly welcome awaits you at Harbour Heights bed & breakfast. Situated only 25 meters from the harbour in an old and quaint 17th century narrow cobbled street; enjoying views over Mount's Bay and down the Lizard Peninsula. Enjoy a home cooked breakfast from our extensive menu; looking out over the stunning views of Newlyn Harbour. Telephone and Internet are available; iron and laundry facilities and sports equipment storage. Parking for guests. In the traditional Cornish fishing village of Mousehole, sitting in a prominent position over the harbour, there are 8 en-suite rooms all beautifully furnished. Many of the rooms have stunning views over the harbour and towards St. Michael's Mount. The Ship Inn is highly recognized by the AA as a B&B, so much so that they were awarded a red diamond in 2004! The pub is a typical Cornish Inn, small and friendly! Food is served all year round for lunch and dinner, and is made using only local ingredients. Sheltered from the Atlantic's fury there is a low tide beach, village and craft shops, galleries and boat trips. Despite its quaintness, this is still a lively working harbour. A stay here fulfils the Small and Friendly promise of a perfect weekend break! Lombard House in Penzance was built in the early 18th century. It is a Grade II listed building with many period features. Located on a quiet south facing terrace overlooking the sea and the promenade. Private guests car park. Family run bed & breakfast offering comfortable,clean & homely bed & breakfast accommodation in penzance and is centrally located in penzance,cornwall. Within short walking distance of the town centre and sea front. We are also close to the bus and train station with the scillonian ferry and heliport serving the scilly isles both being a short distance away. What ever you reason for visiting Penzance,whether for pleasure or business,you will find you stay at Westbourne Guest House a friendly and pleasurable one. Budget or Luxury offers Book now! Book a hotel in Penzance online. Great rates. No reservation fee! Late Deals on Penzance Hotels. Up to 75% off. Book Online & Save! Find Your Ideal Hotel & Location. Great Hotels, Great Rates & Offers. Keywords: Hotels in Penzance, 2 Star, 2Star, 3 Star, 3Star, 4 Star, 4Star, 5 Star, 5Star, Accommodation, Art Deco, Bed and Breakfast, Best Western, Booking, Boutique, Breaks, Cheap, Chic, Child Friendly, Christmas, Coast, Coastal, Contemporary, Cool, Penzance, Cottages, Country House, Deals, Devon, Dog Friendly, Dogs, Dorset, East, England, Escape, Family Friendly, Five Star, Four Star, Golf Course, Guest Houses, Guide, Haunted, Holidays, Hotel, Hotels, Hotels for Sale, in, Inns, Jobs, Last Minute, Late Deals, Luxury Country, Luxury Family, Luxury Spa, Modern, near, New Year, New Years Eve, North, Offers, on, One Star, Pet Friendly, Posh, Quality, Romantic, Sea, Small, Somerset, South, Spa, Special Offers, Surfers, Swimming Pool, Swimming Pools, Three Star, Top, Trip Advisor, Two Star, UK, West, Westcountry, Western, www hotels.